Two for the price of one! 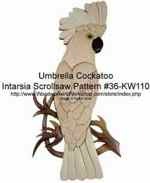 With this Cockatoo pattern you also receive the pattern to make a pair of Cockatoos. The single has 68 pieces and the pair has 110 pieces. The finished project measures 12 inches wide by 20 inches long.